What is an album? Do they still exist? If you are following SMM, you probably don't need a lesson about "albums", as out-dated as they are. A concept from the past - before iTunes and $0.99 singles online. I started buying music for myself with my allowance at about age 12, and naturally I could only afford 45's. ( that's a vinyl disk that spins at 45 RPM (er ... rotations per minute). Your typtical teen had a leather covered "album" filled with these disks. 45s had an :A: side and a :B: side -with the big hit on the A, the lesser on the B. However, the first album that came with my own/personal "stereo" (purchased with my own money) was Who's Next - and *that* I remember well because I nigh on wore out the grooves of the album, playing it again and again. And although Daltry and Townsend aren't what they used to be, it's not for nothing that they were the half-time NFL show back in 2010. OK...OK, nowhere near their prime, but - all things considered - a "primo" production. And the NFL half-time show is mostly made up of songs from Who's Next. It's a tricky one this, as, of course, is honesty, weaving a devious path between credibility and risibility. Achieving both, no doubt. And the heightened self-aggrandisement of claiming that coveted hipper than thou award is no mean attraction. So I lie. There, I've said it. 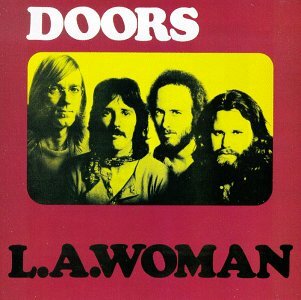 L.A.Woman was not my first album. That was Sgt Pepper, but my sister bought me that because she wanted it. And it wasn't my second. That was Pictures at an Exhibition (E.L.P. ), and my parents, bless them, bought me that, based on my instructions. But it was my third, and the first, bought with my accumulated savings from Christmas and birthdays. So it counts, don't it? Sort of. And I am so grateful of that, because, let me set the record straight, for once and for all, it is and remains one of the finest recordings of this and last century. Let me take you back. I was 14 in 1971. That's a good age to be becoming obsessed by music and it was a good year to be becoming obsessed by music. Now, better people than I have already laid down the challenge that this was the year of the lodestone, most notably, David Hepworth, UK eminence grise of music journalism, sometime presenter of The (Old Grey) Whistle Test, the "serious" grown up big brother of Top of the Pops, clips from each show which litter my previous posts. He was also responsible, in one form or another, for the magazines, amongst others, Smash Hits, Q, Mojo and The Word, often alongside laconic sidekick, Mark Ellen. This is what he says about that year, even going so far as to write a book about it. But I knew none of that then, I was just eagerly lapping up all the sounds exposed to my wide ears. Most afternoons were spent visiting my friendly and local record shop, Complete Audio Systems, of Eastbourne, Sussex, known to one and all as Cas(s)music. With an astonishing indulgence, they happily allowed a stream of spotty schoolboys to put on headphones and nod away for hours listening to side 1 of this, side 2 of that, even if purchases were, well, infrequent. The owner clearly seemed to have a U.S. west coast bent, presumably explaining my enduring love for the obscure and arcane offerings from late 60s and early 70s California: It's a Beautiful Day, Stoneground, Tonto's Expanding Headband, all equally devoured, alongside more familiar fare, Zappa, the Byrds and Jefferson Airplane. Christ, I must have been an insufferable and precocious brat, but happy and fond-remembered days. The Doors, of course, I knew from their big hit single some 4 years previous, but was certainly unprepared for the splendour of the set piece magnum opus that saw my headphones ripped off, replaced by those of my chum Nigel. The storm became ridden and I was instantly smitten. 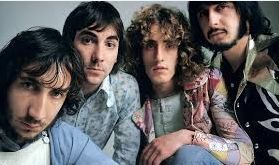 The cover, reproduced at the top, above, had something to do with it, originally having the picture of the band printed onto the yellow inner sleeve, visible through a perspex window, rather than later versions where it was printed as one, all on card. Gone was movie star looks love god Morrison, now a bearded grizzly bear stared balefully out. (I should add I had a thing about beards in those days ahead of being able to grow anything myself. For me the Beach Boys became hip the minute I saw the cover of Live In Concert, ahead even of hearing the songs.......Even Mike Love. Hell, especially Mike Love!) As was my wont, I duly went back and read the inkies of the day, Melody Maker and N.M.E. (New Musical Express) to discover the backstory of booze and bedevilment. I never got round to hearing any more of the record before I was back at the shop, paying my near £2 (about $2.50 today) for my own pristine copy. Unusually I never quite took to the title track. I found it too long, too loud and too, um, obvious. Yes, I have warmed more to it in the intervening years, but my tastes were more to the mellower aspects, Riders and my lasting favourite, Hyacinth House, below. (AKA, probably, the "cocktail music" epithet made by fast exiting erstwhile producer, Paul Rothschild) I was so convinced as to the perfection of this song that I insisted on playing it to my mother, whose tastes were more of the Jim Reeves persuasion. I forget her opinion, but I felt it helped explain that awful question so beloved of parents, so what sort of music is it that you like? I never felt comfortable saying "rock", as that would have meant "and roll" to my disapproving mother. Luckily I could fall back on the mysticism of Morrisons poetry, and, at 14, yes, it was poetry and, yes, it was mystic. Bob Dylan may just have now been awarded the 2016 Nobel Prize for literature, but I know who I would have awarded it to in 1971. And, however corny, today, 45 years on, indeed do I still feel and share the "immaculate" we is, even if I were never stoned. I could play more, point you to more, but time and space have their purpose. I know the Doors have swung in and out of favour, aided and abetted by innumerable books and films, a mythology as much as anything. The naysayers can go take one, I won't and don't listen. How many records from 45 years ago do you still play? How many records of 45 years ago still gain plaudits? It's true, often only of this generations and of any generations awkward teens, but that is truth enough for me. You mean you don't already own this? Buy! O, and that book by David Hepworth? There too.